Data loss prevention is a compliance feature of Office 365 that is designed to help your organization prevent the intentional or accidental exposure of sensitive information to unwanted parties. DLP has its roots in Exchange Server and Exchange Online, and is also applicable in SharePoint Online and OneDrive for Business. Sometimes customers dismiss DLP because they don't consider themselves to have the type of data that needs protecting. The assumption is that sensitive data, such as medical records or financial information, only exists for industries like health care or for companies that run online stores. But any business can handle sensitive information on a regular basis, even if they don't realize it. A spreadsheet of employee names and dates of birth is just as sensitive as a spreadsheet of customer names and credit card details. And this type of information tends to float around more than you might expect, as employees quietly go about their day to day tasks, thinking nothing of export a CSV file from a system and emailing it to someone. You might also be surprised how often employees send emails containing credit card or banking details without considering the consequences. Sensitive information is identified by regular expression (RegEx) pattern matching, in combination with with other indicators such as the proximity of certain keywords to the matching patterns. An example of this is credit card numbers. A VISA credit card number has 16 digits. However, those digits can be written in different ways, such as 1111-1111-1111-1111, 1111 1111 1111 1111, or 1111111111111111. Any 16 digit string is not necessarily a credit card number, it could be a ticket number from a help desk system, or a serial number of a piece of hardware. To tell the difference between a credit card number and a harmless 16-digit string, a calculation is performed (checksum) to confirm that the numbers match a known pattern from the various credit card brands. Furthermore, the proximity of keywords such as “VISA” or “AMEX”, along with the proximity to date values that might be the credit card expiry date, is also considered to make a decision about whether the data is a credit card number or not. A good reference to keep bookmarked is this topic on sensitive information types that explains how each information type is detected. When the risks of data leakage aren't entirely obvious, it's difficult to work out where exactly you should start with implementing DLP. Fortunately, DLP policies can be run in “test mode”, allowing you to gauge their effectiveness and accuracy before you turn them on. DLP policies for Exchange Online can be managed through the Exchange admin center. But you can configure DLP policies for all workloads through the Security & Compliance Center, so that's what I'll use for demonstrations in this article. In the Security & Compliance Center you'll find the DLP policies under Data loss prevention > Policy. Click on Create a policy to start. 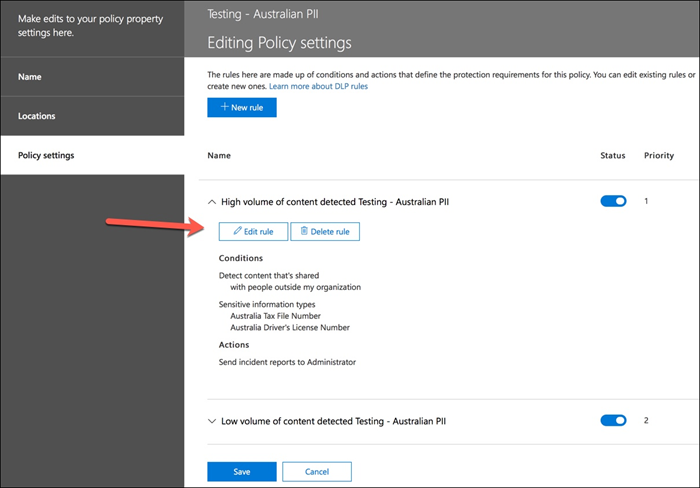 Office 365 provides a range of DLP policy templates you can use to create DLP policies. Let's say that you're an Australian business. You can filter the policy templates to display only those that are relevant to Australia, which fall into the general categories of Financial, Medical and Health, and Privacy. For this demonstration I'll choose Australian Personally Identifiable Information (PII) Data, which includes the information types of Australian Tax File Number (TFN) and Driver's License Number. Give your new DLP policy a name. 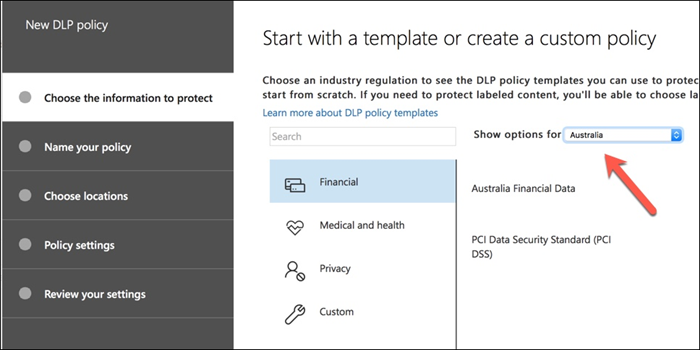 The default name will match the DLP policy template, but you should choose a more descriptive name of your own, because multiple policies can be created from the same template. Choose the locations that the policy will apply to. 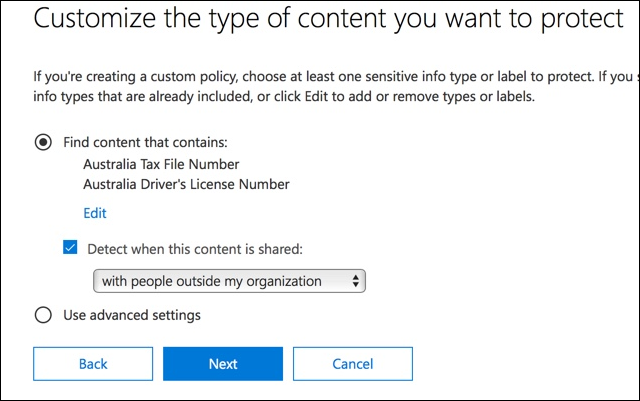 DLP policies can apply to Exchange Online, SharePoint Online, and OneDrive for Business. I am going to leave this policy configured to apply to all locations. At the first Policy Settings step just accept the defaults for now. There is quite a lot of customization you can do in DLP policies, but the defaults are a fine place to start. After clicking Next you'll be presented with an additional Policy Settings page with more customization options. For a policy that you are just testing, here's where you can start to make some adjustments. I've turned off policy tips for now, which is a reasonable step to take if you're just testing things out and don't want to display anything to users yet. 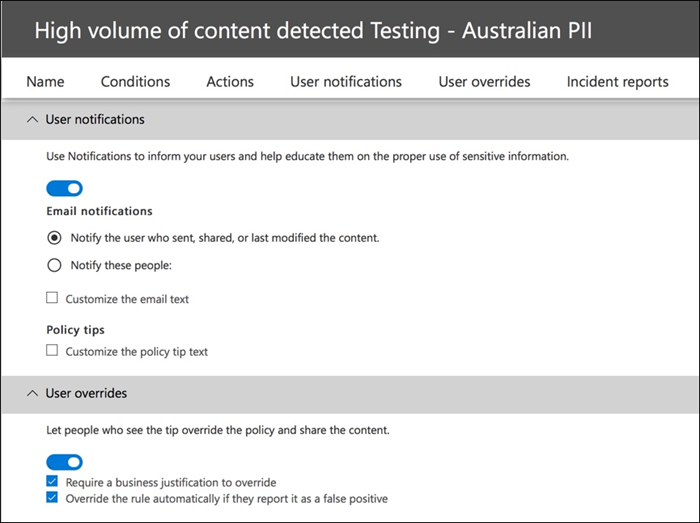 Policy tips display warnings to users that they're about to violate a DLP policy. 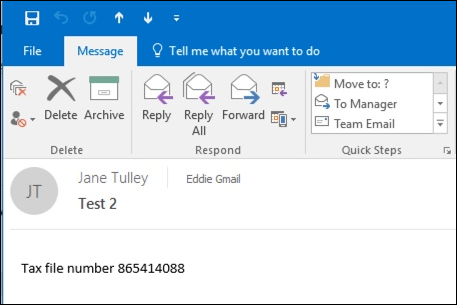 For example, an Outlook user will see a warning that the file they've attached contains credit card numbers and will cause their email to be rejected. The goal of policy tips is to stop the non-compliant behaviour before it happens. 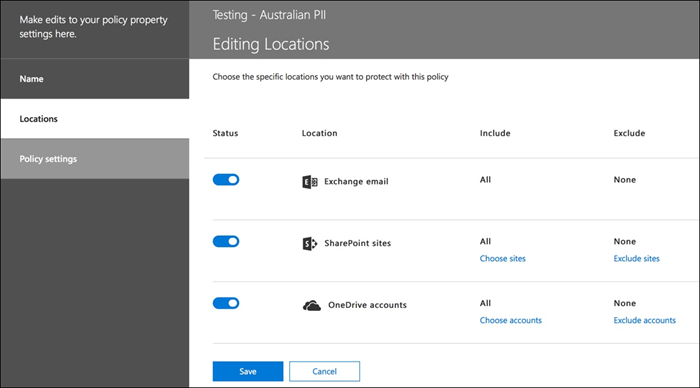 I've also decreased the number of instances from 10 to 1, so that this policy will detect any sharing of Australian PII data, not just bulk sharing of the data. I've also added another recipient to the incident report email. Finally, I've configured this policy to run in test mode initially. Notice there's also an option here to disable policy tips while in test mode. This gives you the flexibility to have policy tips enabled in the policy, but then decide whether to show or suppress them during your testing. On the final review screen click Create to finish creating the policy. Your new DLP policy will begin to take effect within about 1 hour. You can sit and wait for it to be triggered by normal user activity, or you can try to trigger it yourself. Earlier I linked to this topic on sensitive information types, which provides you with information about how to trigger DLP matches. 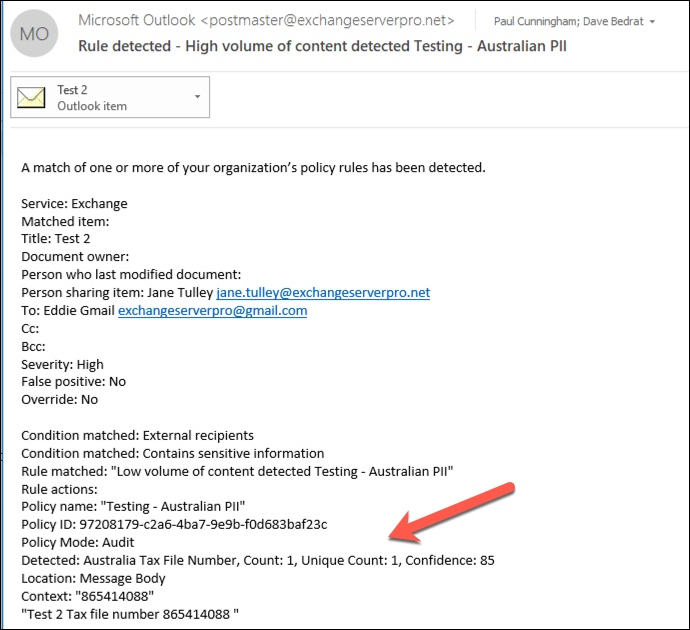 As an example, the DLP policy I created for this article will detect Australian tax file numbers (TFN). According to the documentation, the match is based on the following criteria. To demonstrate TFN detection in a rather blunt manner, an email with the words “Tax file number” and a 9 digit string in close proximity will sail through without any issues. 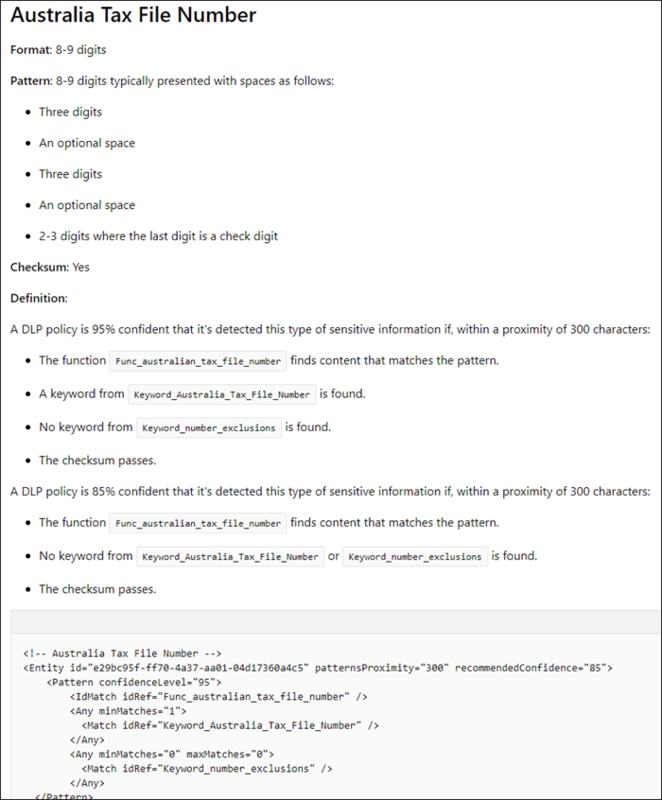 The reason it does not trigger the DLP policy is that the 9-digit string must pass the checksum that indicates it is a valid TFN and not just a harmless string of numbers. In comparison, an email with the words “Tax file number” and a valid TFN that passes the checksum will trigger the policy. For the record here, the TFN I'm using was taken from a website that generates valid, but not genuine, TFNs. There are similar sites that generate valid but fake credit card numbers. Such sites are very useful because one of the most common mistakes when testing a DLP policy is using a fake number that's not valid and won't pass the checksum (and therefore won't trigger the policy). The incident report email includes the type of sensitive information that was detected, how many instances were detected, and the confidence level of the detection. 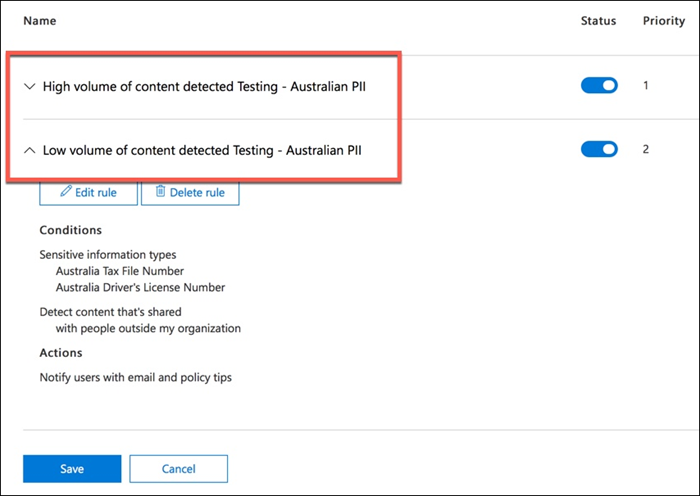 If you leave your DLP policy in test mode and analyze the incident report emails, you can start to get a feel for the accuracy of the DLP policy and how effective it will be when it is enforced. In addition to the incident reports, you can use the DLP reports to see an aggregated view of policy matches across your tenant. As you analyze your policy hits you might want to make some adjustments to how the policies behave. As a simple example, you might determine that one TFN in email is not a problem (I think it still is, but let's go with it for the sake of demonstration), but two or more instances is a problem. 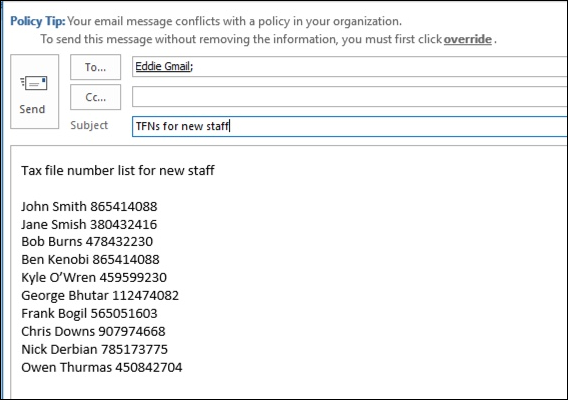 Multiple instances could be a risky scenario such as an employee emailing a CSV export from the HR database to an external party, for example an external accounting service. Definitely something you would prefer to detect and block. In the Security & Compliance Center you can edit an existing policy to adjust the behaviour. You can adjust the location settings so that the policy is applied only to specific workloads, or to specific sites and accounts. You can also adjust the policy settings and edit the rules to better suit your needs. The conditions, including the type and number of instances of sensitive data that will trigger the rule. The actions that are taken, such as restricting access to the content. User notifications, which are policy tips that are displayed to the user in their email client or web browser. User overrides, which determines whether users can choose to proceed with their email or file sharing anyway. Incident reports, to notify administrators. For this demonstration I've added user notifications to the policy (be careful of doing this without adequate user awareness training), and allowed users to override the policy with a business justification or by flagging it as a false positive. 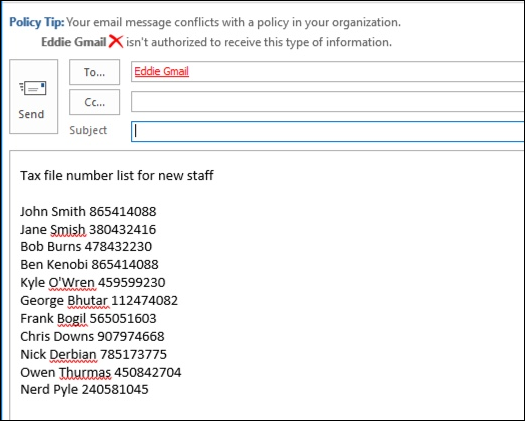 Note that you can also customize the email and policy tip text if you want to include any additional information about your organization's policies, or prompt users to contact support if they have questions. The policy contains two rules for handling of high volume and low volume, so be sure to edit both with the actions that you want. This is an opportunity to treat cases differently depending on their characteristics. For example, you might allow overrides for low volume violations, but not allow overrides for high volume violations. Also, if you want to actually block or restrict access to content that is in violation of policy, you need to configure an action on the rule to do so. 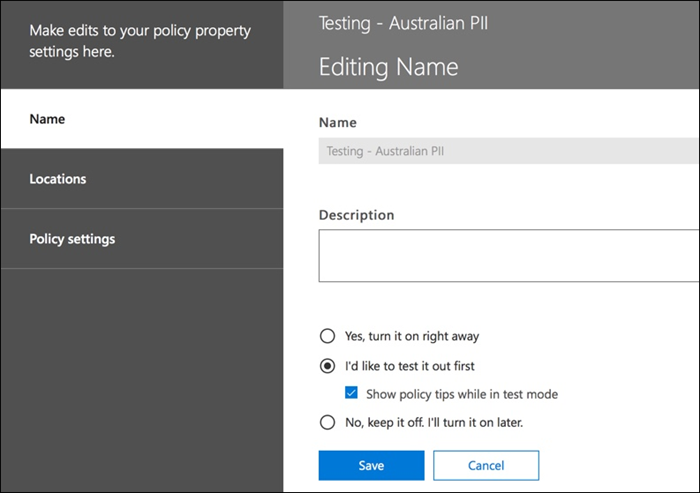 After saving those changes to the policy settings, I also need to return to the main settings page for the policy and enable the option to show policy tips to users while the policy is in test mode. This is an effective way to introduce DLP policies to your end users, and do user awareness training, without risking too many false positives that impact their productivity. On the server side (or cloud side if you prefer), the change may not take effect immediately, due to various processing intervals. 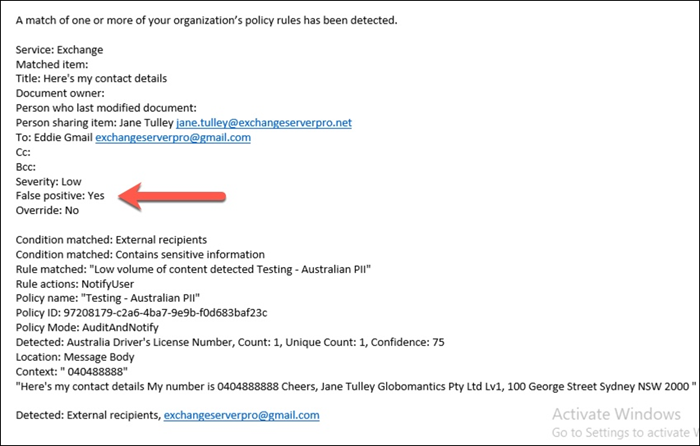 If you're making a DLP policy change that will display new policy tips to a user, the user may not see the changes take effect immediately in their Outlook client, which checks for policy changes every 24 hours. 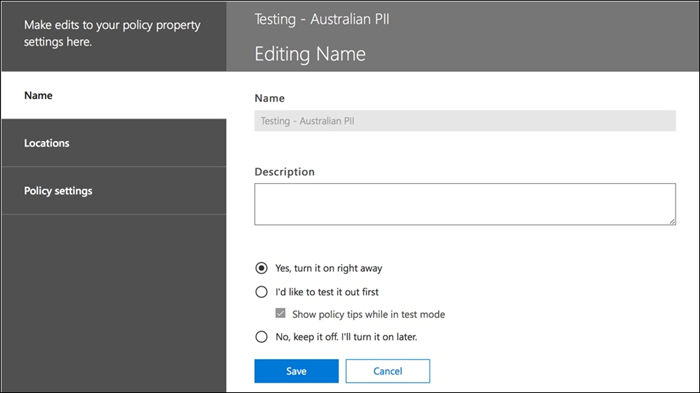 If you want to speed things up for testing, you can use this registry fix to clear the last download time stamp from the PolicyNudges key. Outlook will download the latest policy information the next time you restart it and begin composing an email message. 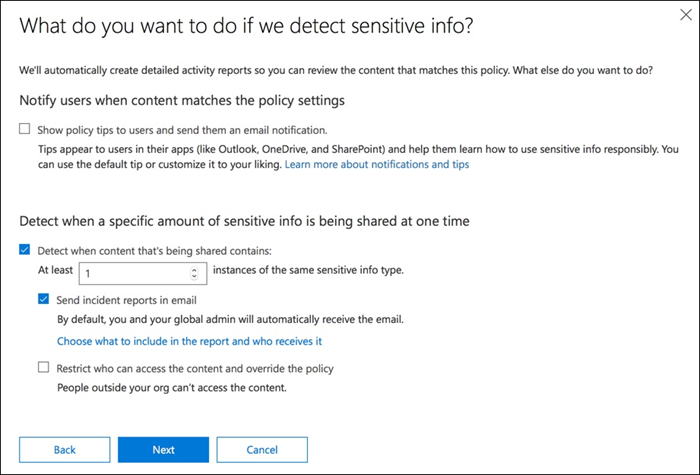 If you have policy tips enabled, the user will begin to see the tips in Outlook, and can report false positives to you when they occur. DLP policy templates are not perfect straight out of the box. It's likely that you'll find some false positives occurring in your environment, which is why it's so important to ease your way into a DLP deployment, taking the time to adequately test and tune your policies. Here's an example of a false positive. This email is quite harmless. The user is providing their mobile phone number to someone, and including their email signature. 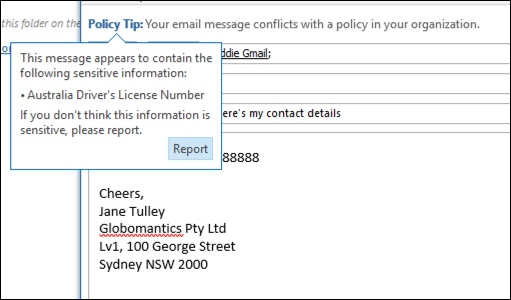 But the user sees a policy tip warning them that the email contains sensitive information, specifically, an Australian driver's license number. The user can report the false positive, and the administrator can look into why it has occurred. In the incident report email, the email is flagged as a false positive. This driver's license case is a good example to dig into. The reason this false positive has occurred is that the “Australian Driver's License” type will be triggered by any 9-digit string (even one that is part of a 10-digit string), within 300 characters proximity to the keywords “sydney nsw” (not case sensitive). So it's triggered by the phone number and email signature, only because the user happens to be in Sydney. Interestingly, if “Sydney, NSW” has a comma, the DLP policy is not triggered. I have no idea why a comma makes any difference here, nor why other cities and states in Australia aren't included in the keywords for the Australian driver's license information type, but there you go. So, what can we do about it? There's a couple of options. One option is to remove the Australian driver's license information type from the policy. It's in there because it's part of the DLP policy template, but we're not forced to use it. If you're only interested in Tax File Numbers and not driver's licenses, you can just remove it. For example, you can remove it from the low volume rule in the policy, but leave it in the high volume rule so that lists of multiple drivers licenses are still detected. Another option is to simply increase the instance count, so that a low volume of driver's licenses is only detected when there are multiple instances. In addition to changing the instance count, you can also adjust the match accuracy (or confidence level). If your sensitive information type has multiple patterns, you can adjust the match accuracy in your rule, so that your rule matches only specific patterns. For example, to help reduce false positives, you can set the match accuracy of your rule so that it matches only the pattern with the highest confidence level. Understanding how confidence level is calculated is a bit tricky (and beyond the scope of this post), but here's a good explanation of how to use confidence level to tune your rules. 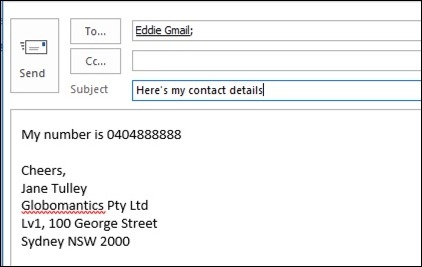 Finally, if you want to get even a bit more advanced, you can customize any sensitive information type -- for example, you can remove "Sydney NSW" from the list of keywords for Australian Driver's License, to eliminate the false positive triggered above. To learn how to do this by using XML and PowerShell, see this topic on customizing a built-in sensitive information type. When you're happy that your DLP policy is accurately and effectively detecting sensitive information types, and that your end users are ready to deal with the policies being in place, then you can enable the policy. If you're waiting to see when the policy will take effect, Connect to Security & Compliance Center PowerShell and run the Get-DlpCompliancePolicy cmdlet to see the DistributionStatus. After turning on the DLP policy, you should run some final tests of your own to make sure that the expected policy actions are occurring. If you're trying to test things like credit card data, there are websites online with information on how to generate sample credit card or other personal information that will pass checksums and trigger your policies. Policies that allow user overrides will present that option to the user as part of the policy tip. Policies that restrict content will present the warning to the user as part of the policy tip, and prevent them from sending the email. Data loss prevention policies are useful for organizations of all types. Testing some DLP policies is a low risk exercise due to the control you have over things like policy tips, end user overrides, and incident reports. You can quietly test some DLP policies to see what type of violations are already occurring in your organization, and then craft policies with low false positive rates, educate your users on what is allowed and not allowed, and then roll out your DLP policies to the organization.